Lookup airport, area, zip and country codes. Is there a better alternative to FourOneOne? Is FourOneOne really the best app in Personal Info Managers category? Will FourOneOne work good on macOS 10.13.4? 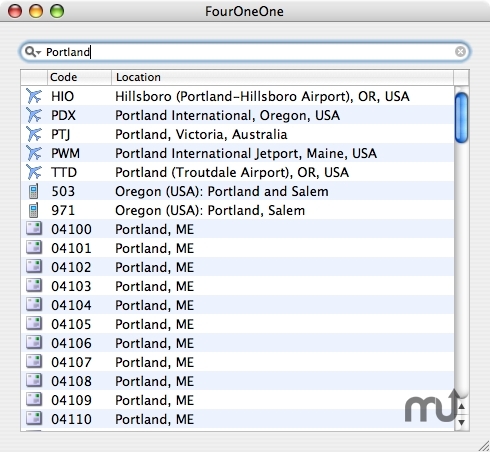 FourOneOne is a small application that allows you to look up airport codes, area codes, country codes and ZIP codes. It was inspired by the (now discontinued) Code Finder application by Andrew Zamler-Carhart. The data comes from freely available files published by the OpenBSD and NetBSD projects. Now uses an internal copy of the data by default (this can be changed in Preferences). This should fix problems that some users had when running with older data files. FourOneOne needs a rating. Be the first to rate this app and get the discussion started!